Come along and look for evidence of our Creator at Silver Springs - "Nature’s Theme Park.” See for yourself why countless movies and TV shows have been filmed here in one of the most beautiful wetlands and clear-water springs in the world! Aboard the world-famous Glass Bottom Boats, we’ll view the abundant Florida wildlife of the Silver River Ecosystem including fish, turtles, alligators, and birds, not to mention the largest artesian spring on the planet! Back on land, we’ll observe the endangered Florida panther, rare species of bears, exotic crocodiles, alligators, and more in their natural habitats. - and maybe even pet a giraffe! At the Live Animal Shows, we’ll learn more about a variety of amazing creatures. Our day as a group will end around 3:00 PM. The park is open until 5:00 PM, so you may want to stay and enjoy other activities such as the Lighthouse Ride, Lost River Voyage, Wilderness Trail, Historical Showcase, Petting Zoo, Fantastic Fountains Water Show, Endangered Species Carousel, and shopping. 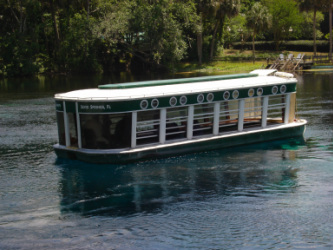 Silver Springs is located near Ocala, approximately 1½ hours from the Orlando area. and $12 for Silver Springs Passholders (child or adult). Cost includes 10:00 AM - 3:00 PM Creation tour plus you may stay on your own until the park closes. Parking: $7 per car, truck, or camper. Creation Adventure Field Trips are usually scheduled on Fridays, but there are a limited number of other open dates listed on the web site calendar. Mondays, Tuesdays, and Wednesdays are generally unavailable due to weekly homeschool science classes. One Friday each month is also unavailable due to monthly high school Marine Science at SeaWorld classes. To visit our website calendar and check for available dates or currently scheduled trips, click here. CONTACT MERILEE CLIFTON at 407-331-3427 or sciencepartners@cfl.rr.com with any questions. Questions? Contact Bill or Merilee Clifton at 407-331-3427 or sciencepartners@cfl.rr.com.